One of the most critical needs in disaster relief is supplying water that is safe for human consumption. Transporting packaged water from distant points is slow, very expensive and logistically difficult. There is a simple, fast and low cost way to provide safe water: purify and package close to or at the place of need. 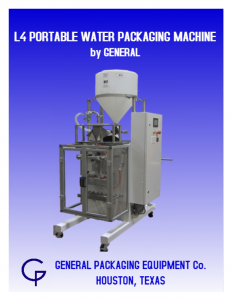 Compact and easily transported, the General WP10 water purification system and the General L4 water bag making and filling machine work together to purify water from a lake, pond, creek, river or unsafe tap water and package it in 1 liter bags at a rate of 1000 per hour. Bags are made using continuous roll stock. One roll of film 150 mm wide X 150 mm in diameter will yield over 4,000 bags. A 1 m X 1 m X 1 m pallet holds film for about 74,000 packages. The cost of the packaging material is roughly $0.025 per package. Both pieces of equipment are on casters and are transportable by pickup truck. Both can be run with a 2800 watt generator or plugged in with standard house plugs. They can be configured to run on 120 V, 60 HZ or 220 V, 50 HZ. 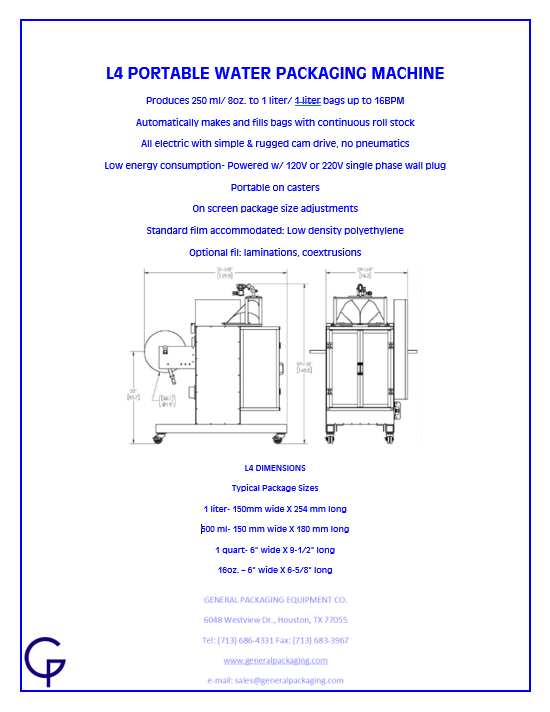 The WP10 and the L4 are designed by and manufactured by General Packaging Equipment Co. in Houston, Texas. General has manufactured bag form fill seal machines for 63 years and has supplied portable water packaging machines to the US Army and the Canadian Army. General builds the machines used for making US Coast Guard approved sterilized water pouches used in survival kits. 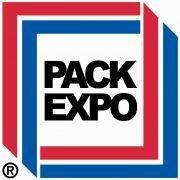 If portable water purification and packaging is of interest to you we will be glad to provide you with detailed information. http://generalpackaging.com/wp-content/uploads/2017/11/fav.jpg 142 142 madisonstudios http://generalpackaging.com/wp-content/uploads/2017/11/General-Packaging-Logo3-300x146.png madisonstudios2019-01-25 09:15:442019-01-25 09:15:44Introducing the L4 Portable Water Packaging machine!